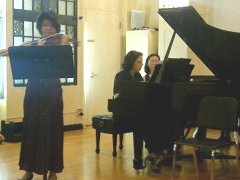 The Alaria Chamber Ensemble offers two courses to the public: Chamber Music and Sonata Class. A telephone interview as well as attendance at the open audition is required of all applicants prior to registration. The open audition is an informal, pressure-free opportunity for participants to meet each other and hear each other play, and for staff to determine appropriate placements. Master classes will be held during the spring (dates TBA). Free for the class participants. Players of all instruments, ages and levels are welcome and registration is open to all. Placement within groups will be based on compatibility with others, determined at the open audition. Repertoire for the class will be chosen from a wide range of periods and styles. Classes meet once a week on Monday or Wednesday evenings for 2 hours (starting at 6pm, 7pm or 8pm). Each session includes one hour of coaching and one hour of rehearsal. Every ensemble will perform informally at the end of each half term. The Sonata Class is a performance seminar for more advanced players with an emphasis on performance in a supportive, non-competitive environment. Space is limited. 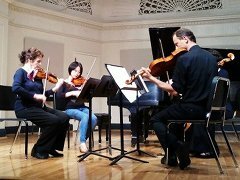 Participants are coached in a group setting and perform in every class session, regardless of how far along the study of their selected pieces they are. At the end of the term, participants produce a public recital to showcase their work. Registration Before registering for any classes you must first contact Yuri Vodovoz at (212) 727-0566 to determine class placement. Fees are subject to change and determined at time of registration.